It’s been a busy Q4 and we hope you’re enjoying the latest updates that have come your way. To close out the year, we wanted to again thank all of our customers for your business and recap some of the big updates that we’ve released this year. 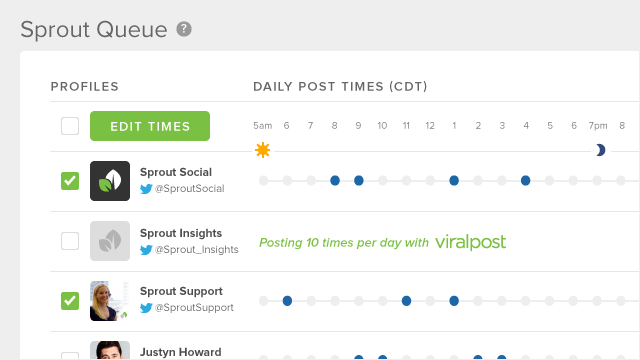 2015 promises to be another year full of updates to Sprout that will make it easier for you to run your social business. In the past few weeks we’ve rolled out a number of highly requested features: LinkedIn Company Page Publishing and updates to Facebook moderation. With the LinkedIn Company Page release you can now connect Company Pages and publish to them in the same Sprout way that you know and love, keeping your LinkedIn followers informed of your latest company news, brand content and job postings. On the Facebook moderation side of the platform, we’ve made it possible for you to view and respond to threaded comments on your posts as well as hide and delete comments from within Sprout. These features make it easier for you to engage with your audience on Facebook by seamlessly replying to individual comments and questions as well as removing inappropriate or offensive content posted by others. Speaking of highly requested features, we also rolled out the ability to set unique Sprout Queue post times for each of your connected profiles. You can now queue content at different times for different networks based on your engagement strategy for each, for different regions or key markets based on time zones, or for individual clients. 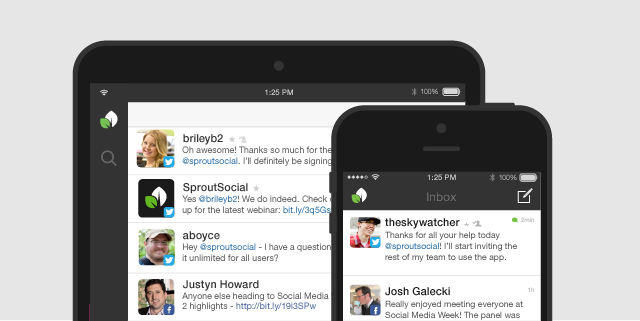 As you know, Sprout is a great tool to manage all of your social communication. To that end, we spent a significant amount of time updating the Smart Inbox this year to provide more visibility into your message volume and activity and, in addition, creating a more collaborative Inbox. In particular, we introduced a completion status and Inbox chart that help you keep an eye on what messages you (and your team) have gotten to as well as those that are left to address. We also rolled out an enhanced Twitter reply experience to bring conversation history and more information about the user to you at the moment of reply, a preview pane for messages in other groups so you can check what’s new without having to switch, and richer content in both the Inbox and Feeds. 2014 also saw a number of reporting enhancements. The big release was our Trends Report, which gives you detailed insights into what people and brands are saying to you on Twitter every month. Brands have used the data in this report to identify social trends applicable to their businesses and to identify important influencers they may want to cultivate relationships with. In addition to the Trends Report, we also added Twitter favorite counts in the Sent Messages Report, and both improved and added additional PDF exports for many of the Sprout reports. The Sprout Social mobile apps saw lots of updates this year, including a total revamp of our iOS apps, as well as the much requested push notifications. The team was busy the entire year making Sprout better for you to use. A few smaller releases included the addition of live chat into Sprout, new and improved weekly summary emails, more permissions within Sprout to control what certain users on your team see and, finally, the introduction of a Team plan, full of features that make Sprout better for teams. As always, we are committed to continuing to update and improve Sprout Social in the coming year so that it becomes even easier for you to run your business and communicate with your audience on social. From all of us at Sprout, we wish you a happy new year and look forward to continuing to grow together in 2015.